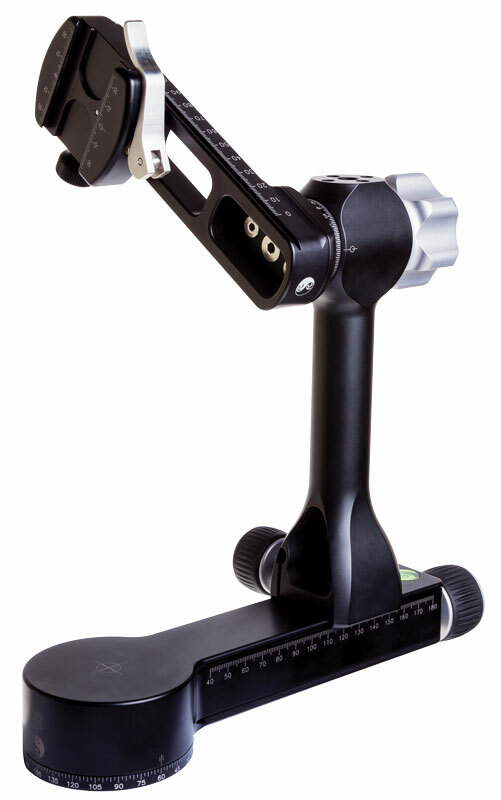 Along with our world-famous BH-55 ballhead and other mounts, Really Right Stuff offers another essential type of tripod-mounted tool: the Pano-Gimbal head. These robust and versatile pan-tilt heads are a mainstay among wildlife and sports photographers, and are considered the absolutely best option for tracking and photographing moving subject matter, especially with telephoto lenses 300mm and up. Whether it’s a bald eagle diving into the icy water after a catch, or a Formula 1 race car flying by at breakneck speeds, no other head will allow you the best chance of catching that action with the accuracy that you need. Many people wonder why they might choose a gimbal head over their BH-55 ballhead to handle a lens like a 500mm or 800mm prime. The answer is easy: balance. While our workhorse BH-55 holds even the biggest glass out there when locked, actually controlling such a lens and framing your subject can be quite challenging for even experienced shooters. This is where the PG-02 Pano-Gimbal heads come in. Your long lens mounts via the same quick-release plate or foot using our patented quick-release clamps, and can pan and tilt 360-degrees with independent locking knobs for each axis. Properly balancing the lens, by sliding the plate or foot within the clamp, allows positioning the gear at any angle without using the locking mechanisms. It’s possible in most cases to balance at a point so that no matter where the lens is aimed, the gear will remain stationary on its own. With the PG-02 head leveled (see below on leveling bases) this balance will be the same in all directions with no “drift” to a low point, and with the lens aligned properly within the collar every shot should be level as well. What this really means is that all of your energy is dedicated to aiming, moving, and shooting, not supporting the weight of that lens. Your lens is essentially “floating”, supported fully by the head, and ready to move where you need it at a moment’s notice. You can lock the panning or tilting axes individually if you need to isolate a move in one direction, and of course lock both to hold a position for longer. Contrast this with a ballhead, which can hold the weight of the lens when locked, but tends to “tip” under heavy weights as you try and balance them atop the narrower ball joint, meaning the task of supporting falls to the shooter during framing or movement. This is why, almost unanimously, photographers shooting moving subjects (fast or otherwise) choose the PG-02 Pano-Gimbals. Like all products from Really Right Stuff, the PG-02 line of gimbal heads was designed to deliver superior precision and performance over other market options. Our large panning base uses both roller and ball-type bearings and a thick grease to give the smoothest action possible, without jittery starts and stops. The tilt axis uses a large bearing as well, and operates smoothly with even the heaviest lenses mounted in a side-mount or traditional “full-gimbal” cradle. We offer two basic styles of the PG-02 Pano-Gimbal: the traditional “full-gimbal” (PG-02 FG) as well as several versions of a side-mount gimbal, like our PG-02 LLR (Long Lever-Release). These different models all use the same basic horizontal and vertical components, and differ only in the mounting orientation and clamp in use. The PG-02 FG “Full-Gimbal” head will support a lens from below, with our patented lever-release style clamp on the cradle, which can vary in height along a pivoting vertical rail. This mounting configuration matches those traditionally offered in gimbal heads, and is fully adjustable to allow lenses of different heights to be aligned with the tilt axis. With the vertical arm at the 110mm mark (on the horizontal arm’s scale) the lens will be centered over the horizontal axis. 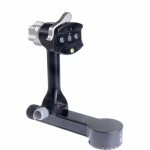 Side-mount gimbal heads like the PG-02 LLR or PG-02 Pro/L offer a simpler setup, with their clamp (lever-release or screw-knob) mounted directly to the pivot axis of the vertical arm. This puts the clamp to lens plate joint in a vertical orientation, cantilevering the weight of the lens out via the lens collar itself. 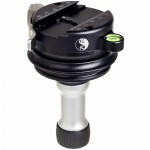 A lens mounted to this head is automatically centered at the tilt axis. The vertical arm position can be adjusted to center the lens over the horizontal pivot axis (a cross-hair is laser-engraved to help with this operation). Because the only difference between the styles is the mounting orientation/location, most users will find they perform equally well with all lenses. The biggest areas of subjectivity seems to be the methods for loading the lens onto the head, and the feel of the tilting articulation once loaded. 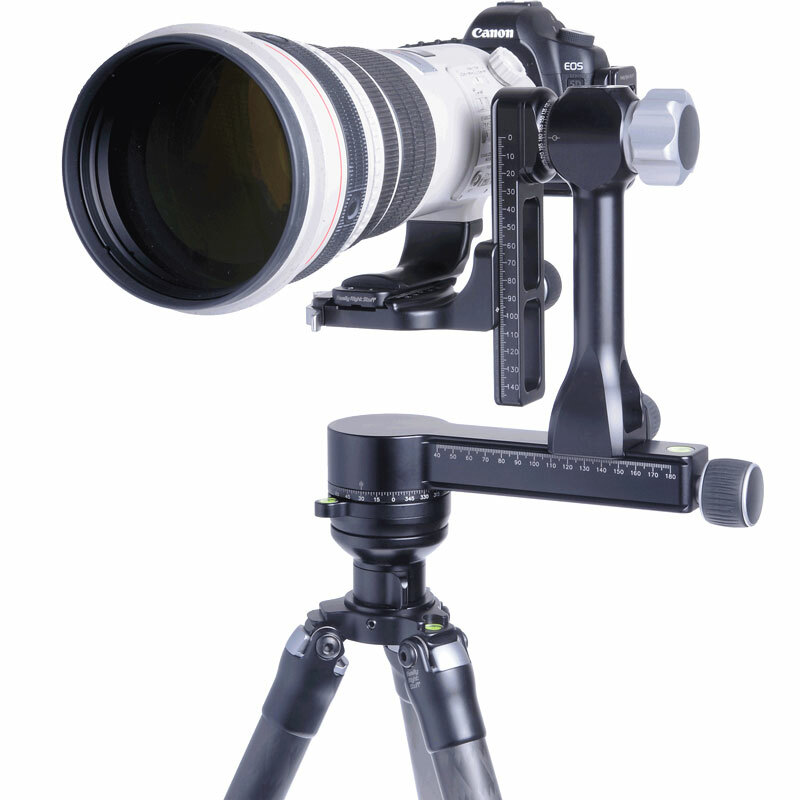 Because the PG-02 FG allows you to vary the height of the lens, and because the lens is mounting to the vertical rail which extends off the tilt axis, the feel can be more “swing-like” than the simple fulcrum or “teeter-totter” action of the side-mount models. Bottom line, you should choose the configuration that gives you the greatest peace-of-mind when it comes to lifting and securing your big glass – after all, it’s a big investment. 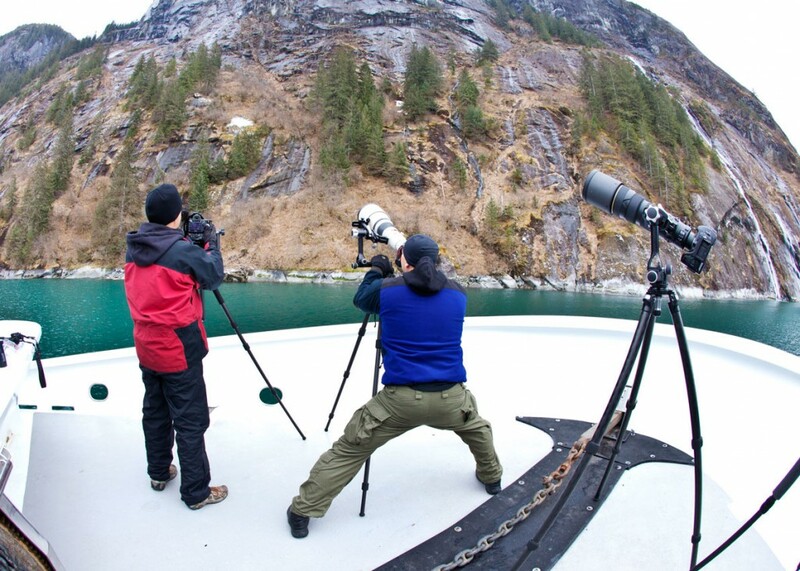 Hal Schmitt of Light Photographic Workshops can be seen here using his 800mm lens on our PG-02 LLR to shoot a distant mountain goat from a moving, pitching boat off the coast of Alaska. Joe has joined Hal on trips to Alaska to capture eagles, whales, and glaciers, and always takes his PG-02 with him. With a simple clamp on the vertical arm, the two components of a side-mount gimbal head can be mounted parallel to each other for more compact storage. As with all models, they can be stored separately as well, but with side-mount models the vertical arm component is much more compact. A side-mount gimbal leaves much more open space around the lens barrel, meaning you’ll have much easier access to focus, zoom, and control the lens as you might if hand-holding. L-plates can mount directly, meaning you don’t have to change configurations to use non-collared lenses. Aside from superior performance, the PG-02 heads are set apart from other gimbals by one amazing feature: they also function as multi-row panorama heads, giving you two heads in one. This capability is possible because of our innovative modular arm design, which separates the “L”-shaped mechanism into two linear components, allowing for finite adjustment between the horizontal and vertical pivot points and alignment of the lens axis to both. With the lens pivoting on-center in both axes, all that’s needed is the No-Parallax-Point setting, achieved just like with any pano package from Really Right Stuff: with a nodal slide. The resulting rig will look and perform just like our PG-02 Pro Omni Pivot panorama package, but with a base that works equally well for gimbal action. The PG-02 components are precision laser-engraved for pano shooting as well, with degree markings every 2.5-degrees and reference marks every 90. The PG-02 FG is just as capable of panorama shooting, but instead of adding a whole nodal slide, all that’s needed is swapping the PG-CC cradle clamp with the FAS clamp. With the vertical rail turn to be horizontal, it becomes a built-in nodal slide. A PG-02 head may just be the most versatile piece of gear you might find, meaning you have to carry far less into the field without losing capability. By adding our B2-LR-VC Video Clamp to a side-mount style PG-02, you gain the use of a control arm, and can use the head for shooting basic video with your DSLR or digital compact. Because L-plates can directly mount to a side-mount gimbal (the clamp can spin 360-degrees so it has no bias), there’s no need for a separate head to accommodate your non-collared lenses. Not only are the PG-02 heads light themselves, but eliminating the need to carry a ballhead for your landscape shooting while on a wildlife trip (for example) will save you pounds off your pack. One accessory that’s a must-have for any PG-02 head is a leveling base. Really Right Stuff offers models to fit any tripod perfectly and give up to 30 degrees of articulation range for easy one-step leveling of the head above. Many photographers are content with simply leveling the head using the legs of the tripod, which is fine. But when time is of the essence, or when you might need to keep quiet and stealthy to keep from spooking that bird or mammal, nothing helps more than having the convenience and speed of a leveling base. Gimbal heads are the perfect tool for many types of photography, and adding the pano functionality makes the PG-02 Pano-Gimbal line one of the most versatile pieces of gear out there. Wildlife, sports, macro, video, panos – the PG-02 can do it all, and support the heaviest lenses made without skipping a beat! Like all Really Right Stuff products, our Pano-Gimbal heads are made from the finest quality CNC-machined aluminum and stainless-steel, anodized and laser-engraved. Every part, down to the smallest screw, is made and hand-assembled here in the United States. We’re proud to back up our world-class product with a 5 year parts and workmanship guarantee, and the best possible customer service and support. If you have any questions about the PG-02 Pano-Gimbals, other gear in the catalog, or even general photography-related inquiries, feel free to contact us or come visit our San Luis Obispo, CA showroom and see the PG-02 heads for yourself. In the field a lot of time is spent carrying the tripod/gimball head/huge lens slung over a shoulder. Since the only locking mechanism is to tighten the two screws that limit motion – is there a risk of repeated over tightening stripping the threads? Does the PG-02 FG carry as comfortably and securely as the PG-02 LLR? You should have no trouble carrying a PG-02 (any model) loaded with a lens for short distances over your shoulder. With heavier glass you should always exercise caution when doing so, but the locking points and quick-release connection can support even an 800mm at those odd angles. The knobs of the PG-02 (pan/tilt locks are the same across all models) have a good positive feel when locking, so you can tighten all the way by hand easily and quickly. You’d pretty much have to use tools to do any damage when it comes to over-tightening. Jim, nice write up. I probably use my PG-02 LLR for about 70% of my shooting these days, and I don’t shoot that much with super telephoto lenses either. I find it so nice for quick set-up and fine adjustments using non-collared lenses. I love the fact that with an MPR-CL or CL II, I can be perfectly balanced with just about any camera/lens setup and composition adjustments are nearly effortless. A bit bulky, but so sweet to use. Joe Sr.
Alfred, that’s correct. Most of us consider a leveling base a must-have accessory, simply because the tedium of leveling the platform of the tripod using 3 leg adjustments is beyond the scope of our patience. With a leveling base, it’s unlock, level, lock, all in a matter of seconds. When the sun is setting, that cloud is moving, or that animal might wander off back into the thicket at any moment, the last thing you want to be caught doing is messing with the tripod. Do you have any video or stills of the PG-02LLR in use with a non collared lens? I have an L-plate for my Canon 5Diii and I figure that I would just orient the vertical clamp to take the side portion of the bracket and thus use the gimbal feature. Is that correct? Generally speaking you can mount the L-plate directly, but to get true gimbal-like balance with a non-collared lens, you’d still need some way to adjust the fore/aft position of the camera/lens. We like to use a nodal slide like MPR-CL II (or whichever you might need for panorama shooting) along with the L-plate to gain that, as shown here (front view). If you have any other questions about how that’s done please let me know or email us at info@reallyrightstuff.com. Thanks!